Growing in Grace Podcast: 536. 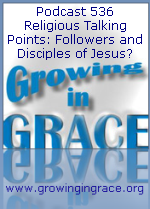 Religious Talking Points: Followers and Disciples of Jesus? 536. Religious Talking Points: Followers and Disciples of Jesus? As Christians, we often like to describe ourselves as followers and disciples of Jesus. But is this really how we are identified in Him? Did Jesus really encourage people to follow him as a disciple or was He attempting to show that nobody could successfully accomplish this? Jesus carefully described the list of rigid requirements needed to be like Him in order to be His disciple. He cautioned those people under the law to carefully count the cost in order to help them realize they would not be able to pay the price that would be needed. 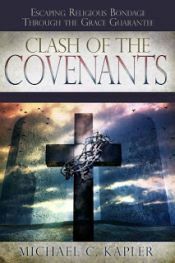 Thankfully, our faithfulness to God is not what is on display, but it was God's love and dedication towards us that would be the centerpiece of the gospel.